Hormones are interesting things... because during my last pregnancy﻿ I didn't really like ice cream - and that's very strange for me - especially because I was pregnant during those hot summer months. I think I only made ice cream one time last year. I think if you have an ice cream maker and you like ice cream - you should definitely be making a lot more ice cream than that - don't you think? Lately, I've been on this kick where I'm making mixes and then I can create lots of other things, desserts, dinners, etc from one mix. 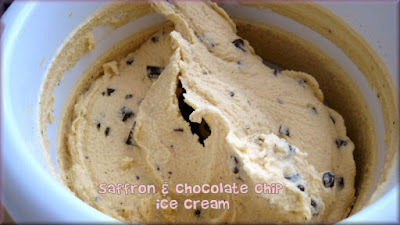 This ice cream is made from Saffron Master Mix - which I also used to make the Saffron-infused Carrot Cakes. Why saffron? Why not? I received 2 grams of saffron from a foodie exchange from Greece. It's Greek Saffron. Perhaps it's cheaper to buy in those parts. My husband use to work at the grocery store when he was in college. He was a box boy or something like that. He said that the most expensive item in the grocery store by weight is saffron. They usually only sell it in tiny little tubes. And over here when I've seen it in the spice section - you buy about .1 gram of it for like 2 euros. So imagine my happiness when I have 2 whole grams of it. How much is 2 grams - just eyeballing it - it's about 2 tablespoons. That's a lot of saffron! 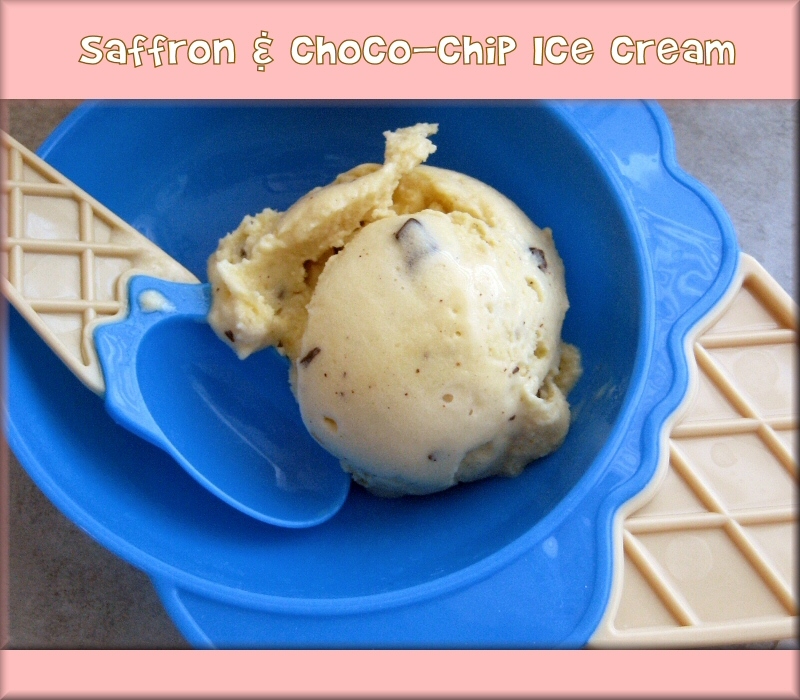 Mix together and pour into ice cream maker. Add 1/2 cup chopped up dark chocolate pieces in last 15 minutes of cycle. 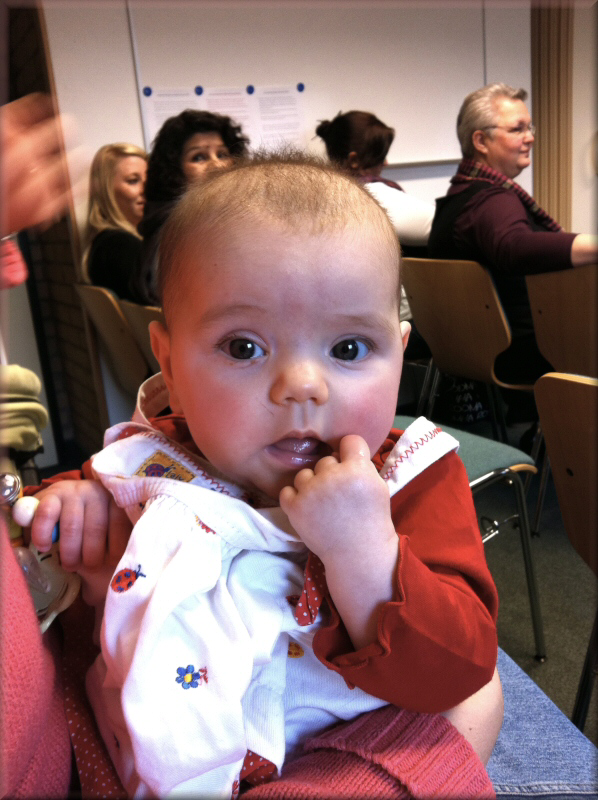 Siembra is now 5 months old and she's so adorably cute. Here is a cell phone snapshot of her attending church with Mama. I must say, she is the most popular girl at church. Everyone wants to hold her and just be her friend. I can't say I don't blame them. I just can't get enough of her either :) I'm smitten! I'd give up ice cream cravings again for this little doll anytime! I can't believe I just found out two neat things about you. One, that you have this blog in addition to your sweet rolls blog and two, that you're Mormon. So am I. I have this new linky on my blog every week called "Sweets for a Saturday" and I'd like to invite you to stop by this weekend and link up your delicious ice cream creation. Hi Lisa... you are, too huh? it's a small world afterall! that's the song i always think of when i meet another one of "us"
i'll check out your linky thing this weekend - if i have time, we are going out on a date saturday late to see Tron -- i know it's been out for a while in the U.S. but it just got released here not too long ago.